Cooked with love? …. in a large electrical pot. Lol. A little morning prep work, place everything into the cooker, clean up & set a timer. Go to work, run errands, play with the kids, your fur babies, exercise, go brunching or whatever your heart desires. Low & slow eight hours later, an amazing delicious meal that may look fancy but didn’t require much of your time. That’s what I call a wonderful dinner! Note: I make a bowl of mashed potatoes as well. My Mom used to include mashed potatoes with this meal and my Dad is the one who taught me how to make mashed potatoes. Fall is my favorite season! Gorgeous colored leaves, apple cider, football, hockey, boots…a long list of seasonal favorites that includes soup for the soul. Inspired by Carrabba’s Italian Grill, Spicy Sicilian Chicken Soup. A warm bowl of deliciousness! I printed a copy cat recipe, doubt it will be “exactly” like theirs. Similar ingredients along with some cooking confidence, it tastes amazing. Whether you’re a chicken noodle kind of lover, creamy or vegetable soup lover…there’s just something about soup that’s good for your soul. Cook on low for 6 hours, remove chicken breasts and shred, place back in the soup. Add potatoes and pasta, allow to cook/simmer additional hour. Note: I peeled & boiled potatoes, cooled down and slightly mashed for pieces. A history of leftover meat & potato meal made into this savory dish. My former, very Irish Mother-in-law taught me her recipe when I was 22 years old. Since that was ‘way back’, I’ve tweaked; added my own seasoning and vegetables …including beer. I zhuzh’ed it up for everything green day! Normally cooked in a plain casserole dish. My son, Tyler always gets a second serving …and enjoyed every bite of this meat and potato bowl. 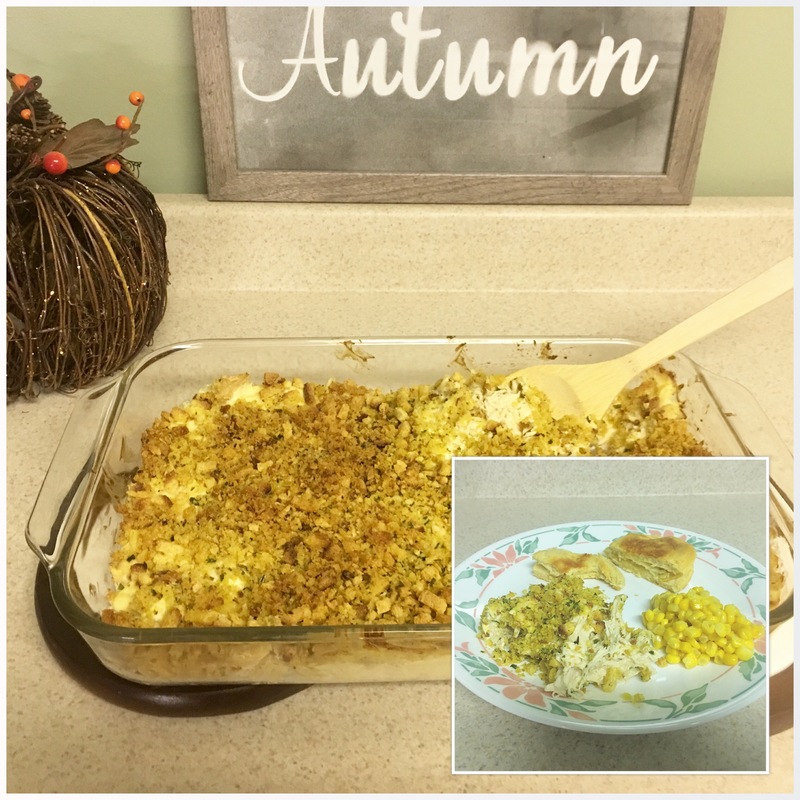 This chicken casserole is a recipe passed down by my Grandmom. Chicken Elegant — it’s not really an “elegant” dish however, it disappears quickly at gatherings and is still one of my son’s favorites. Place chicken in crock pot or slow cooker; pour chicken broth over chicken and cook for 3-4 hours on low (chicken should fall apart when cooked thoroughly). Shred or chop chicken to your liking, place in 13×9 dish. Mix; stir cream of chicken soup and sour cream together in a bowl; combine with chicken in casserole dish; mix it all up. Pour uncooked stuffing into a separate bowl, melt 1/2 stick of butter in saucepan and pour butter over stuffing; mix together. Spoon stuffing evenly on top of chicken (as a crust). If stuffing appears dry, I melt a little more butter to pour over top. Bake 350 for 25-30 minutes. Note: Check stuffing crust top after 15-20 minutes; cover with foil if browning quickly & continue to bake. Allow to cool and serve with side of vegtables or salad. Enjoy!